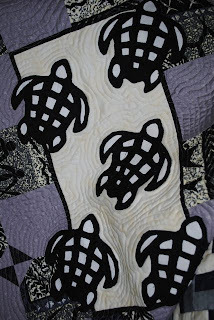 Explorations in Quilting and Life: The Turtles are Done - Anniversary Quilt! 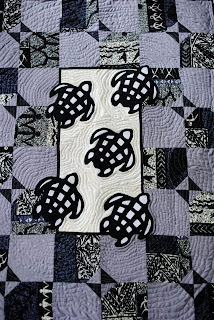 The turtles are done - well, I still have to bind the quilt but that is nothing. 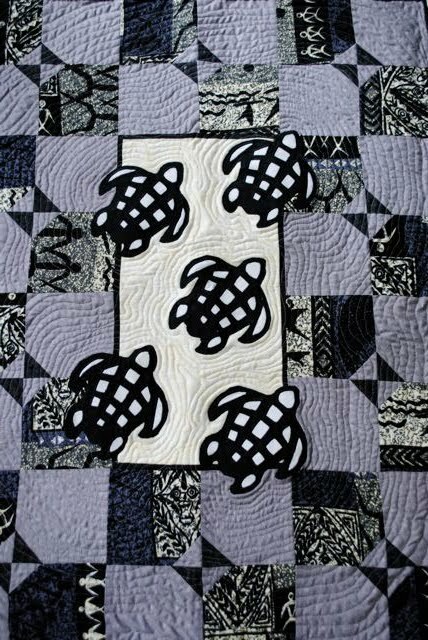 And, as my husband has said once more that he really likes the turtles, I have realized that it can be our Anniversary Quilt. We have been married 37 years today. Funny, but this year we are both remembering it. Typically over the years I have been away at an annual aikido summer camp that I must attend. The timing of the camp this year allows me to be home and it is sweet. I had intended to keep this quilt any way. I used some fabric I picked up years ago on Maui and I was so pleased to have finally found a use for. 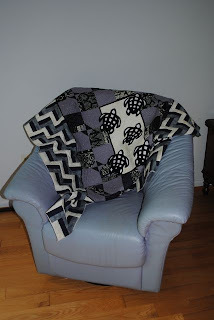 The purple throughout the quilt makes it a perfect touch for the lavender leather chair in our bedroom. I learned a lot with this quilt. It piecing it definitely challenged me. (See earlier post.) In the end, I am glad I persisted. I am particularly pleased with how the quilting of the center portion turned out. It does look like the turtles are swimming in a current, doesn't it! I intend to use the effect in some other designs flowing through my mind (a solitary whale jumping, a zen rock garden effect). The nice thing is that, given where I am placing it, it will be one of the first things I see every morning when I am home and it will make me start the day with a smile.